We love the gem-like brilliance of the rich colors in the Watermark collection from Studio e used in this project. Isn't it gorgeous? Perfect for stars! 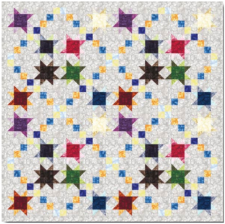 They have done an excellent job on the pattern, and this project will be good for any level of quilter. Enjoy!